It’s not like you’d take it apart and build something else with it. This involves proper Lego skills and the last thing you’d want to do is take it all apart once you’d built it, though it would serve no purpose other than looking good. This is where the Lego Movie has got me thinking. See, we buy boxes of Lego with instructions how to build things and actually, it doesn’t matter. We don’t HAVE to build those things, we don’t have to follow the instructions and have perfect areas of Lego with the relevant characters from that area in there. Mix it up! Who cares that Duplo is bigger. Snow White can have a coffee with the Lego Friends (who I’m sure made a split second appointment in the ‘oh dear’ part) – it all fits together and you can make what the hell you want with it. On chatting with a friend who also watched it yesterday, she remarked on how she’d often thought it was crazy you can’t just buy Lego bricks without it having a purpose, but the film has turned that around – you don’t have to follow the pattern, just follow what’s in your head. If there’s nothing in your head (as Emmet found until he realised there was and that a double decker settee wasn’t such a rubbish idea) then just try anyway. How dare anyone tell you what you’ve done is rubbish if you like it! The other characters dismissed the Lego double decker settee yet found a great purpose for it in the end. It doesn’t matter what other people think. Of course, the film plot is based on what was in the mind of a nine year old, so it’s never going to make complete sense, yet it does make a lot of sense. The boy plays on his dad’s superglued perfect Lego collection having adventures his dad would never let him have while his mum is upstairs making taco’s on a Tuesday. His dad realises Lego is there to be played with (and heck, if I had a Lego Sydney Opera house I would be like the dad) and lets his son do just that – of course on the condition his sister and her Duplo gets to play too. Ugly ugly Duplo, but it was such a lovely moment – the moment the dad lets go of what is essentially a precious plastic object of beauty to him that serves no purpose, and it becomes a wonderful world of adventure for his kids. That to me is why I nearly cried at the Lego Movie. That is also the reason why I won’t be getting the Lego Sydney Opera house. Not yet anyway. Because despite the story of Emmet, it was a story about family, about the moment as a parent you let go of your past and allow your child(ren) to embrace it. Lego is there to create and be free, to make whatever the hell you want. To not follow the instructions, to make what you want – that’s what I used to do, even when I had a kit. 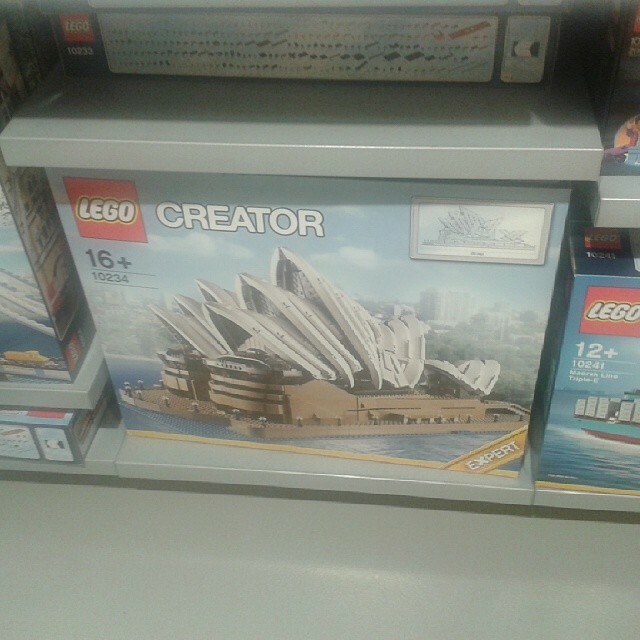 Besides, the Lego Sydney Opera House is bloody expensive.